Home / NBA / pace / Is pace contagious? Possessions, despite being analytical bedrock, are not an officially tracked NBA statistic. As a result, the counting of possessions in an NBA game has historically been indirect. We tease them out of the box score by counting the ways a possession can end, like physicists searching for the Higgs boson by tracking the particles into which it immediately decays. This indirect measurement has limited our ability to understand how pace works in the NBA, and who controls it. The box score can tell us that the Golden State Warriors play at a very fast pace, and squeeze in an above average amount of possessions into 48 minutes of regulation play. The Warriors are clearly fast on offense, but does that spillover into their defense? Do their opponents get caught up in the Warriors' hectic flow? The box score cannot answer these questions, but the play by play logs can. Last year, using that play by play data, I showed that the Warriors had a very slow defensive pace, despite having the fastest overall pace in the league (they were, and are, very fast on offense). I later launched an interactive tool that allowed for detailed drill downs on a team's offensive and defensive pace. 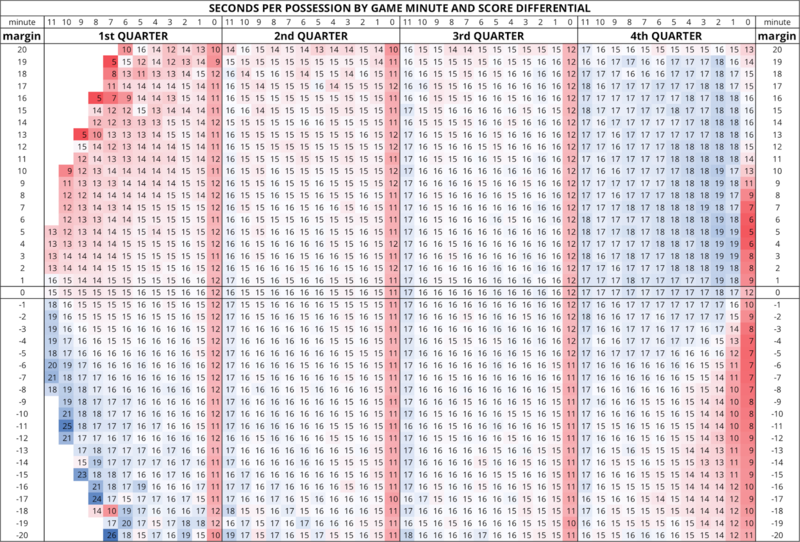 And this season, I added a pace report to my win probability graphs and box scores, which includes a breakdown of each team's quarterly offensive pace. Using this same play by play derived dataset, we can examine the in-game relationships between the pace of each offense. I have average seconds per possession for both the home and away team for the past 10 NBA seasons (over 12,000 regular season games). 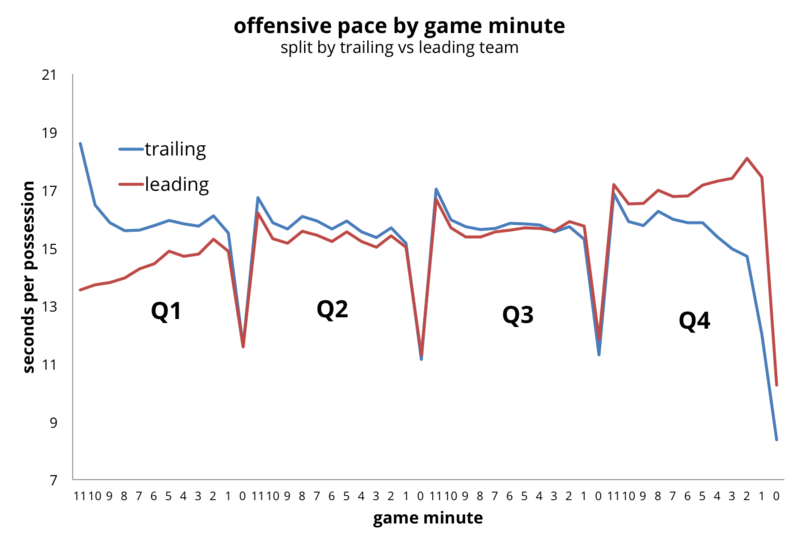 If pace was contagious, and each team's offense fed off each other's tempo, we should see game to game correlation between home and away pace. As it turns out, the correlation coefficient between home and away pace is just 0.046. It appears that pace is not contagious. NBA teams seem largely inclined to play at their own pace on offense, irrespective of their opponent's tempo. For example, this past season, the Utah Jazz were the slowest offensive team in the league, averaging 16.3 seconds per possession. The Golden State Warriors were the fastest, with just 13.5 seconds per possession. These two teams met four times in the regular season. In those four games, the Jazz averaged 18.0, 16.3, 16.6, and 16.6 seconds per offensive possession, and the Warriors averaged 14.2, 13.7, 13.4 and 13.7 seconds. Each team was largely immune to the contrasting tempo of its opponent. So if pace isn't affected by opponent offense, what factors do drive pace? Is it solely dictated by the offense? Or can the way a team plays defense control pace? Looking at offensive and defensive pace statistics, it does appear that pace is more heavily dictated by the offense. The gap between the slowest and fastest offense last season was 2.8 seconds per possession. The gap between the slowest and fastest team defense was just 1.3 seconds. Here is how this regression model would predict the Warriors' pace if they were to play the Cavaliers (not that I'm getting ahead of myself). Pace is also situational. Even the slowest team in the league will pick up the pace if it finds itself trailing late in the 4th quarter. 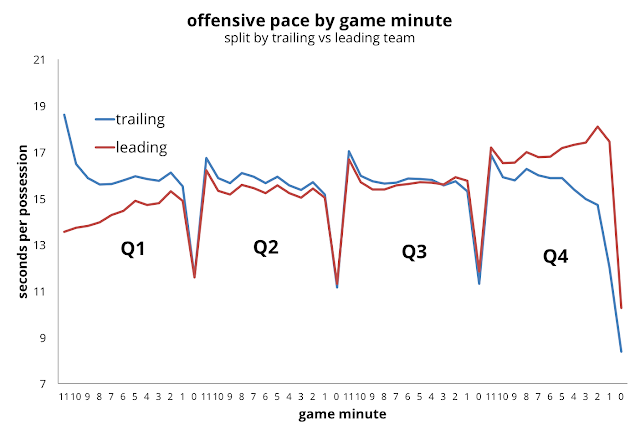 The chart below shows how pace varies by game minute, split by trailing versus leading teams. For the first three quarters, trailing teams have a slower pace than a team with a lead. However, once the 4th quarter starts, that relationship flips, as trailing teams push the pace and the leading team tries to slow things down. The eye chart below delves even deeper, showing how average seconds per possessions varies by scoring margin. You can see when teams start protecting their lead in the fourth quarter, and how the trailing team forces the issue in the final minute, with even quicker possessions on offense, and intentional fouls on their opponent to cut short their possessions.